A Southern California woman says she was kicked off a Delta Air Lines flight from Atlanta after she reported that she thought she smelled alcohol on the pilot’s breath, NBC-LA is reporting. Cynthia Angel said she was on the July 19 flight preparing to leave Hartsfield-Jackson International Airport when she and three other passengers struck up a conversation with one of the plane’s pilots, according to NBC-LA. “ … the pilot walked by us, and I jokingly said, ‘Boy, you had been here a long time,’” Angel, 51, told NBC-LA. 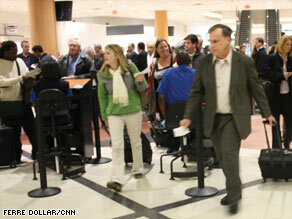 The flight’s departure out of Hartsfield had been delayed for almost an hour at that time. The pilot - who was actually the captain on that flight - responded to Angel and the other passengers. When he walked away, another passenger asked whether anyone smelled alcohol on the pilot’s breath, NBC-LA said. “We all agreed that he did smell of alcohol, but we didn’t know if he had been drinking or what we should do about it,” Angel told NBC-LA. Angel said she volunteered to talk with the head flight attendant, saying, “I didn’t know what protocol is, but I believe I smelled alcohol on one of the pilots’ breath,” NBC-LA reported. Kevin Smith's most famous role is a guy who rarely speaks. But he's got a lot to say – much of it profane – after being kicked off a Southwest Air flight because he didn't fit comfortably into the seat. "You [messed] with the wrong sedentary processed-foods eater!" Smith, whose next film, Cop Out, comes out Feb. 26, posted on Twitter. It was one of many Tweets recounting the actor/director's humiliating expulsion Saturday from the Oakland-to-Burbank, Calif. flight. Southwest said in a statement airline officials had called Smith to offer their "heartfelt apologies," but also stated his removal was for the "safety and comfort of all customers." Smith, 39, originally purchased two tickets "as he's been known to do when traveling Southwest," the airline noted, but when he decided to fly standby on an earlier flight, only one seat remained. Although he had been seated, he was asked to leave. "If a customer cannot comfortably lower the armrest and infringes on a portion of another seat, a customer seated adjacent would be very uncomfortable and a timely exit from the aircraft in the event of an emergency might be compromised if we allow a cramped, restricted seating arrangement," Southwest said. President Barack Obama has promised to tighten up aviation security in the wake of last week’s frightening attempt to blow up a Northwest Airlines flight as it approached Detroit, but experts say nearly all the steps Obama is likely to consider come with tradeoffs that have scared off other policymakers in the past. Obama said he’s ordered a review of the terrorist watch list system to determine why a warning the U.S. Embassy in Nigeria received from the father of alleged bomber Omar Abdulmutallab didn’t result in Abdulmutallab being barred from flying to the U.S. or given extra security screening. The president also said he’s asked his subordinates to look at why existing screening didn’t detect the plastic explosives he managed to bring on board the plane — allegedly by concealing them in boxer shorts crafted by Al Qaeda bomb-makers. Some things likely to be quickly addressed are specific to last Friday’s attack. They include giving more weight to complaints from family members that a relative has become radicalized and may engage in terrorism. "The Saudis will tell you that’s some of the most important and reliable information you can get,” said Fran Townsend, homeland security coordinator under President George W. Bush. There are other obvious loopholes to be closed. Officials say they’re considering an automatic review of outstanding visas for people entered into the broad U.S. terrorism database. And perhaps greater information-sharing with allies such as Britain, which, unbeknownst to the U.S., refused to grant Abdulmutallab a new student visa after he allegedly provided the name of a nonexistent school. But broader policy changes have greater ramifications — tradeoffs that the Bush administration was well aware of. And while increasing security may seem like a political no-brainer, some frequent travelers have become so incensed at what they call “security theater” that they are recoiling at steps already taken, such as banning the use of blankets and personal items in the last hour of some flights. Paris, France (CNN) - French investigators said they are looking into problems encountered by an Air France jet last month in nearly the same spot over the Atlantic where another Air France jet mysteriously crashed in June. Air France flight 445 was flying from Rio de Janeiro, Brazil, to Paris, France, the night of Nov. 29 when it encountered the problems, the French accident investigation agency, BEA, said in a news release this week. It is the same route taken by Air France flight 447 when it went down in the Atlantic Ocean in stormy weather June 1, killing all 228 people aboard. The investigation agency has not established the cause of the crash, and large parts of the plane - including both flight recorders - have never been found. "The analysis of what happened could lead to complementary explanations about the accident of flight AF 447," the investigation agency said. Flight 445 encountered "severe turbulence" about four hours after takeoff on Nov. 29, forcing the pilots to descend, Air France said in a statement after the flight. The crew sent out an emergency radio message to indicate it had left its flight level, Air France said. The flight, with 215 people aboard, "continued normally" after half an hour of moderate to severe turbulence, the airline said. Air France declined to comment on the investigation agency's statement this week. There was a time when airline travel was a special treat, the kind of occasion that inspired passengers to dress up. Now, the awe people once felt about flying through the clouds is tempered by additional fees, cramped seats and horrifying tales of fellow travelers - such as the one about a man dubbed "Mr. Poopy Pants."